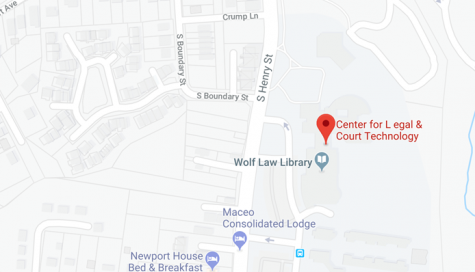 The Center for Legal & Court Technology is located at the William & Mary Law School in Williamsburg, Virginia. Please note that a parking permit is required to park in the Law School parking lot. You can get a temporary permit from the Law School Administration Office or the library desk upon your arrival. Take I-64 East toward Norfolk/Williamsburg. Take Exit 238 (VA – 143) US-60/Camp Perry/Williamsburg. Merge onto VA-143 East toward Williamsburg/Jamestown/Yorktown, go .5 miles. Turn Right onto VA-143 S and continue 2.5 miles. The street will turn into S. Henry Street. Turn left into the circular drive in front of the Law School, then right into the Faculty/Staff parking lot. Obtain a temporary permit in the Law School Administration Office. Display the permit on the driver’s side dashboard. If you already have a temporary parking permit, you may pull directly into the Faculty/Staff lot and park. Be sure to display your parking permit on the driver’s side dashboard. Take I-64 West toward Richmond/Williamsburg. Take Exit 242A (VA-199) toward Williamsburg/College of William & Mary. Continue on VA-199 for 3.6 miles. At the second light, turn right onto S. Henry Street (VA-132). Continue on S. Henry Street for 1.4 miles. Turn right into the circular drive in front of the Law School, then right into the Faculty/Staff parking lot. This content has been updated on February 26, 2019 at 2:52 pm.